A passenger sitting behind main opposition Republican People’s Party (CHP) deputy Sezgin Tanrıkulu on a plane asked in a tweet whether he should kill the CHP deputy by strangling him. “I am sitting behind Sezgin Tanrıkulu on the plane… Those asking me to kill him with a garrote will take care of me when I am in jail, like this message,” the passenger wrote. The passanger was reported to be an academic working at Ankara university. An investigation was launched into Tanrıkulu immediately after Turkish President Recep Tayyip Erdoğan criticized the deputy for saying that civilians were being killed in attacks by armed drones. Tanrıkulu is accused of insulting the government of the Turkish Republic with his statements about civilian deaths in drone attacks. Erdoğan, who was speaking during a press conference on Friday ahead of a visit to Kazakhstan, blasted Tanrıkulu for his statements about civilians being killed by drones. “One representative of the main opposition party appears and makes a statement about armed drones. He claims they shot civilians. Where are the civilians? Drones are killing terrorists. Our armed forces will continue their fight against terror and terror organizations. CHP representatives cannot stop it,” Erdoğan said, adding that he would expect the CHP leader to question whose side Tanrıkulu is on. 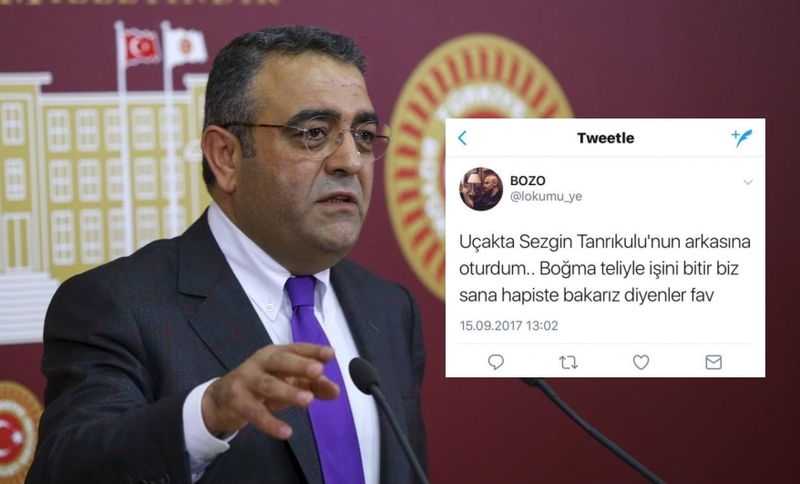 Following Erdoğan’s remarks accusing Tanrıkulu of supporting terrorists, the CHP deputy responded to Erdoğan in a tweet and said he had shared the names of the civilians killed by armed drones on Twitter. Tanrıkulu said in his message Erdoğan might be attacking him because of a sense of guilt.